Soil Amendments Tips | Soil Preparation in Santa Barbara | Down to Earth Landscaping Inc.
You are here: Home / Commercial Landscaping / Soil Amendment Tips for Santa Barbara Landscapes. 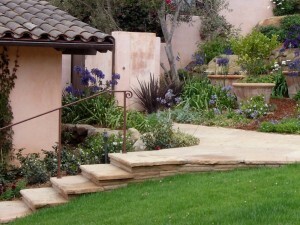 Soil Amendment Tips for Santa Barbara Landscapes. Soil amendments and proper soil preparation are essential when installing a new landscape. As a matter of fact, it is arguably the most important component of a successful landscape. Clients often pay for a new landscape completely unaware that the installer doesn’t even have a clue what needs to go into the native soil for proper plant growth. Often enough, even the person doing the installing is unaware that THEY are unaware of it. Many of our clients tell up stories about uninformed and uneducated “landscapers” installing landscapes without knowledge of soil amendment. This is sad, on the part of the landscaper for not knowing the consequences of his ignorance , but also because a poorly amended soil bed cheats both the client and the ecology out of a healthy, balanced lawn and garden. Soil preparation with the proper soil amendments is our specialty! A properly amended bed is also responsible for sustaining the vitality of your garden landscape for years to come. What is the soil’s organic matter? Healthy soil is teeming with the microscopic and larger organisms that perform many vital functions including converting dead and decaying matter as well as minerals to plant nutrients. Why is soil minerals importatant? This leads to the topic of mineral depletion in landscape beds. Mineral nutrient depletion continues to be a problem in soils. Many natural processes, such as weather and erosion, cause depletion. More significantly, throughout Santa Barbara County human accelerated depletion is caused by improper building AND landscape development. The reversal of the damaging effects humanity causes our environment begins with education. These activities cause nutrients to be removed and organic matter to be depleted from the soil’s natural cycling system. Building and painting contractors are dumping toxic chemicals every day and killing organic matter to the point where soil may become sterile. However, many well meaning “weekend warrior” landscapers don’t realize that that failing to amend the soil can be just as damaging to the ecology as dumping chemicals into their storm drain. Without proper amendment, soil loses its delicate ability to nurture plant material. Furthermore, the initiation of non-native plant material also requires augmentative amendment necessary in order for these “transplant” species to survive and flourish. So what DOES Down To Earth Landscapes, Inc. do for soil amendment? – Well, that is our little secret. Give us a call. We’d be happy to show you how we can turn a patch of badly performing soil into a blossoming masterpiece! For further information, please contact us today ans schedule an appointment. We’re here to help!